Easy to set-up stand assembles in minutes, with only simple tools needed! This plasma TV stand is a smaller standing display, perfect for placing a touchscreen at a shopping centre for use as a directory! 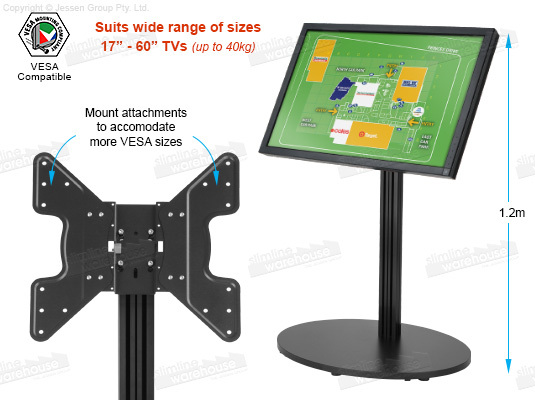 The flat screen television display has an angled mount that is VESA compatible for hole patterns 100 x 100mm through 400 x 400mm. You can place your flat screen monitor that is 17" - 60" and weighs less than 40kg onto the display! 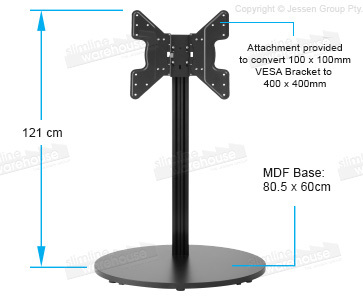 A plasma TV stand, like flat panel stands and LCD displays, is made from aluminium for a durable holder that holds up well to the rigors of constant use in any location. The black finish sets this display apart with its sleek and stylish look. The entire display is portable as well, and needs only simple tools for quick assembly. A nylon carrying bag is included to bring the stand to and from events easily! Our online catalogue has hundreds of products in stock today for you to choose from, with this vast selection including many different categories appropriate for many businesses types. With over 20 years in the business, Slimline Warehouse is leading provider of high-quality goods at low prices. Orders paid prior to 1pm EST will despatch same day to Sydney, Melbourne, Perth, Adelaide, Brisbane, Cairns, Gold Coast, & anywhere else in Australia! 17", 19", 21", 27", 29", 32", 37", 39"
40", 42", 46", 47", 49", 50", 55", 60"